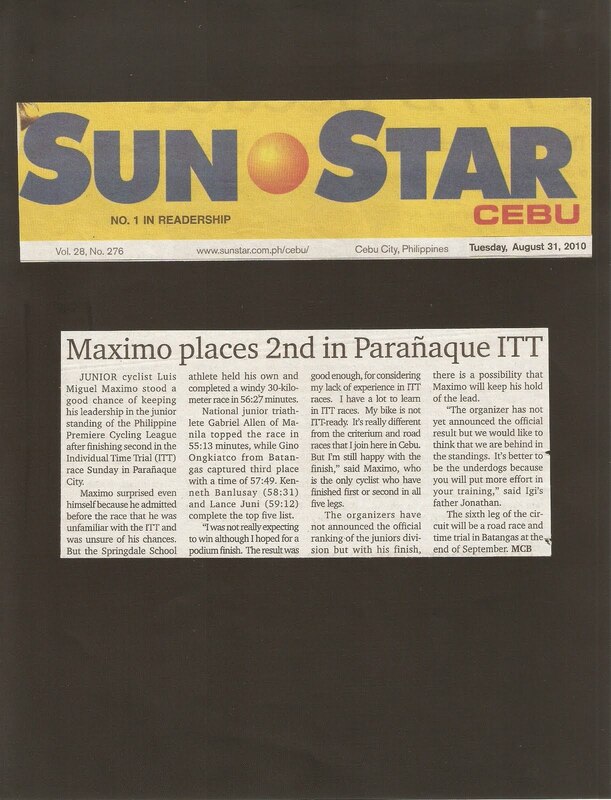 JUNIOR cyclist Luis Miguel Maximo stood a good chance of keeping his leadership in the junior standing of the Philippine Premiere Cycling League after finishing second in the Individual Time Trial (ITT) race Sunday in Parañaque City. Maximo surprised even himself because he admitted before the race that he was unfamiliar with the ITT and was unsure of his chances. But the Springdale School athlete held his own and completed a windy 30-kilometer race in 56:27 minutes. National junior triathlete Gabriel Allen of Manila topped the race in 55:13 minutes, while Gino Ongkiatco from Batangas captured third place with a time of 57:49. Kenneth Banlusay (58:31) and Lance Juni (59:12) complete the top five list. “I was not really expecting to win although I hoped for a podium finish. The result was good enough, for considering my lack of experience in ITT races. I have a lot to learn in ITT races. My bike is not ITT-ready. It’s really different from the criterium and road races that I join here in Cebu. But I’m still happy with the finish,” said Maximo, who is the only cyclist who have finished first or second in all five legs. The organizers have not announced the official ranking of the juniors division but with his finish, there is a possibility that Maximo will keep his hold of the lead. The sixth leg of the circuit will be a road race and time trial in Batangas at the end of September.